Take your city back and breathe freely. The revolutionary R‑shield nanofiber scarf for a smogless ride was funded 428 % on the Kickstarter! Breath the clean air only without fashion compromises. Unique nanofiber filter protects you. The city is your playground. The city used to be your playground. You used to be able to ride the streets, run the parks, and hang around, leaving all the traffic behind. But the car fume, dust, and pollution took that away from you. Now is the time get it back! Introducing R‑shield. A stylish scarf and a high- tech respirator in one. Say goodbye to smog, bacteria, allergens and uncomfortable masks. Say hello to clean air without fashion compromises. 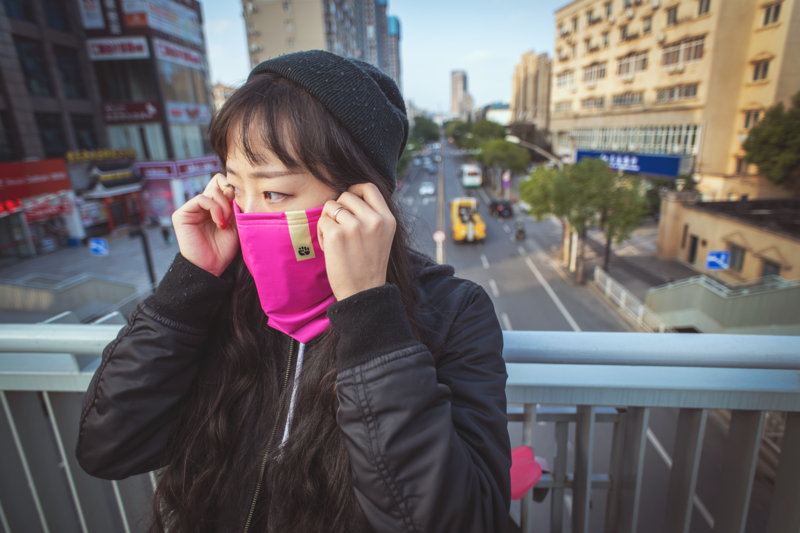 The scarf is a great alternative for our nanofiber facemask ReSpimask as it uses a unique filter with special nanofiber layer that captures 99.9% of all dangerous airborne particles and microorganisms. It protects users from viruses, bacteria, dust, pollen and mold spores while being perfectly breathable. Thanks to the sophisticated engineering you will be free from of everything up to 100nanometers. How big are the dangerous particles and what protection brings RESPILON nanofiber filter? When designing R‑shield, we have focused on maximum comfort, as well as utility. Thanks to the high-​tech design and perfect ergonomy, one size fits all R‑shield will serve you, not the other way around. revolutionary scarf made from ecological high tech nanofiber material, capturing 99.9% of all dangerous airborne particles and microorganisms from polluted air. To anyone who wants to enjoy the freedom of movement in the city, whether that be on your bike, scooter, skateboard, or just on your own. Breathe life into the activity you love. RESPILON filtration half mask is the new revolutionary mask that captures 99,9% of smog, emissions, allergens, viruses, bacteria, dust, mold, and other dangerous particles. RESPILON protective facemask is a protective medical facemask with advanced nanofiber technology captures 99.9% of smog, emissions, viruses, bacteria, molds, pollen, dust and other dangerous particles.